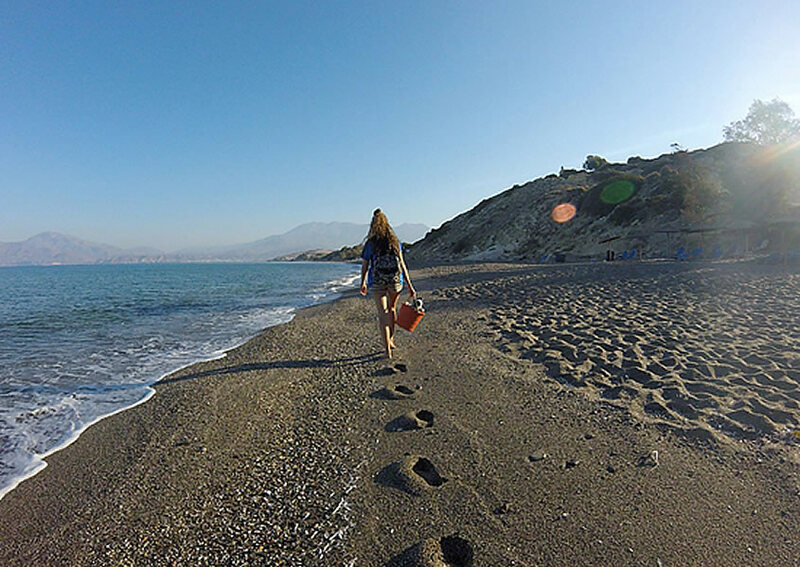 Since 1993, ARCHELON has been recording and protecting sea turtle nesting activity on the beaches of the Bay of Messara in southern Crete. The area is the third largest loggerhead (Caretta caretta) nesting habitat on the island of Crete, with an average number of 60sea turtle nests each year. The 8km of nesting beaches are beautiful, wide, and sandy, and the sea is very clear and clean; fortunately, most of the area has not been impacted by tourism and other activities. The crystal blue water and the sand dunes give the area an exotic character, offering peace and relaxation to visitors. ‘Patrolling’ the beaches every day (Morning observation), during which loggerhead reproductive activity is recorded. Protecting the nests in situ (with ‘fencing’) from both human activity and/or predation by mammals, and relocation of nests, when necessary. Constructing special ‘shading’ structures to guide hatchlings to the sea in areas where artificial light (from roads, shops, etc) may disorient the hatchlings when they emerge from the nest. Excavating nests after the hatchlings have emerged, in order to estimate the hatching success. ‘Patrolling’ the beaches during the day to raise bathers’ awareness of the importance of the nesting beaches. Driving, maintaining equipment, maintaining the camp and its facilities (i.e. cleaning, etc.) and various jobs such as painting and carpentry. Artistic skills such as drawing and photography can also be quite useful. Following the protocol for dealing with injured or dead sea turtles, if necessary. The area offers many free-time activities to choose from: Explore Matala village, which was a famous hippy area during the 60s and the 70s, swim at the wonderful sandy beaches near the campsite (Matala beach, Red beach, etc) or at the nearby fishing villages (Kommos, Kalamaki, Kokkinos Pyrgos, Agia Galini),hike across the famous gorges and mountains of Crete (Agiofarago gorge), visit the famous hippy caves. You can also rent a car and visit the surrounding areas. The Messara project is ideal for relaxation as it is far away from the large tourist centres, and at the same time you have the chance to enjoy some of the music events (the Matala festival) that take place there throughout the summer. 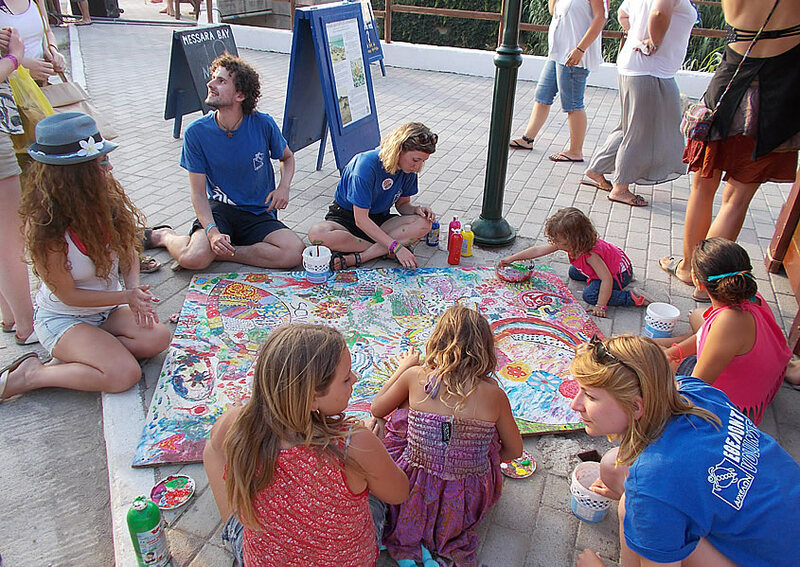 Volunteers will live in the campground designated by ARCHELON for the duration of their participation in the Project. The ARCHELON Southern Crete Research Field Station is based in the municipally owned campground in the village of Matala. The site is located on a sandy cliff close to the historical caves of Matala Bay, and in close proximity to the sea. Supermarkets, a bakery, and cafeterias with WiFi access can easily be reached on foot. Volunteers must be prepared to take part in a communal life, and to live and work in both populated and secluded areas, often as members of small teams and usually under harsh conditions. Although relevant experience is not necessary, the ability to live and co-operate with people of different cultures and backgrounds is essential. Sea turtles come into the bay to nest in early May, together with the first tourists. The first team will be expected to kick off the project and the ARCHELON Field Station around the 8th of May. Monitoring, nest protection and public awareness activity will get busier every day up to mid-June. From mid-June to about mid-August, everything escalates: final number of nests is reached, numbers of visitors on the beaches go up fast and reach their peak, and first hatchlings are out. Volunteer numbers need to be reinforced for this very busy period. From mid-August to end of September hundreds of hatchlings reach to the sea with the help of volunteers and this an excellent time for public awareness and conservation work combined. The Field Station and the project are closed around the end of September. Participation is arranged in full weeks, each to be calculated as 7 days from the date of taking up duties (e.g. if starting on a Tuesday, last day of duties will be Monday). The arrival date to the project site is the day before taking up duties. The departure day from the project site is one day after the last day of duties. Volunteer participation fees cover the cost of accommodation, administration, training and accident insurance coverage (up to a limit) as well as the annual subscription to ARCHELON. The participation fee is paid once (in a single payment i.e. no partial payments are accepted) and proof of payment needs to be sent to ARCHELON before the volunteer status is confirmed. D-Later than 4 weeks from the confirmed date of participation, cases of no show or early departure: there will be no refund of the amount paid. A minor change of participation dates is allowed ONCE free of charge, before the payment of fees. If a significant change of dates is requested after the payment of fees, the terms of cancellation policy will be applied as appropriate. Greek speakers are welcome and a specific number of them will be accepted with a reduced volunteer participation fee under the same rules & cancelation policy, see link. You will need to be in the project one day before your first day of participation and you can stay one day after the last day of participation in the project. The time of arrival needs to be sent by e-mail to the Volunteers Officer at least 5 working days before a volunteer arrives to take up duties. Each volunteer gets an exclusive ARCHELON “volunteer” T-shirt upon arrival. ARCHELON is not in a position to offer financial assistance. Volunteers are expected to cover their travel and personal costs along with their food expenses. Because of the communal lifestyle, volunteers usually share living expenses, estimated at around €25-€30 per week. Anyone who does not wish to participate in the communal arrangement can estimate their expenses at about €15 per day. In case of an internship, after submitting your on-line application, please inform the Volunteers Officer (volunteers@archelon.gr) of the requirements of the University well in advance and preferably before the end of February 2019. Please also note that no scientific data from this project can be used for any report you may have to write.